This semester I was lucky enough to have room in my schedule to continue working a few days a week at ACS. My summer internship is over but I’m still working part time as this year has been extremely busy and there is always work needing to be done. My “summer internship” ended on sort of a slow note; much of the busy scouting was over and the next thing to focus on was CSNT’s (Corn Stalk Nitrate Test). This test is done right before harvest and it requires cutting whole plants (around 15) from different areas of the field to get a representative sample. We cut the stalks 6 inches up from the ground and then again 8 inches up from that cut, giving us an 8-inch piece of stalk. We then quartered those 8-inch stalk pieces and kept only 1 of the 4 quarters for each stalk. We put those pieces in a paper bag and sent them to the lab to be analyzed. The results from this test are important to farmers because it lets them know how much nitrogen was taken up by their plants which is a relationship to how much they applied; either over applied, under applied or applied the correct amount. With regulations on CAFO dairies only getting stricter, this allows farmers to adjust their application based on what the plant actually took up. The PSNT allows them to know what they need to apply pre-harvest but the CSNT lets them know how well they did following the recommendations determined by PSNT. 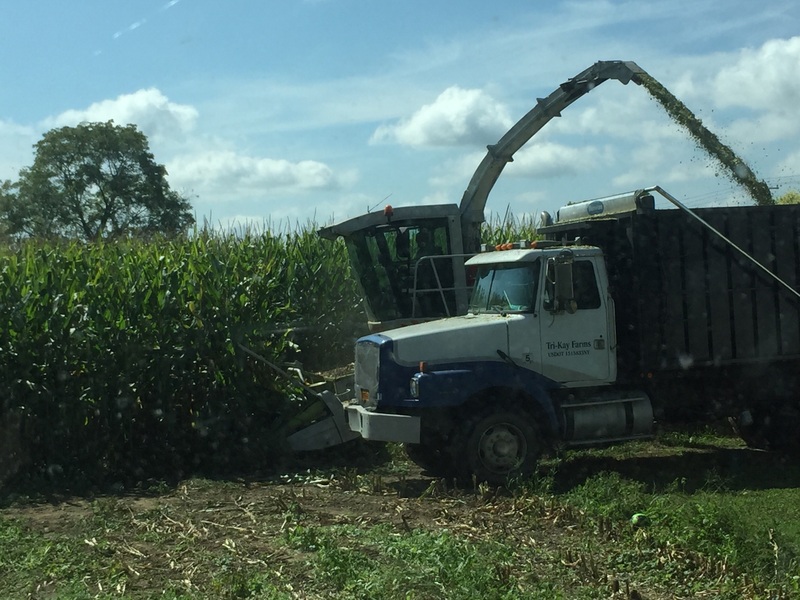 The dry matter test for corn was also a test we did a lot of and that consisted of us running the sample plants through a small wood chipper into a big garbage bag, and from that sending a smaller sample to the lab to be analyzed. Doing this before harvest gives farmers an idea of how much feed they are going to have after harvest is in and allows them plan accordingly if they think they need to purchase more. For the majority of farmers we dealt with this year, having too little corn was not a concern unless they weren’t able to get it planted during our very wet spring. As harvest got to be underway, the next stage of busy work started and that was post-harvest soil sampling. Depending on the field, either whole fields were sampled as one sample or multiple sections within that field were sampled. Some fields are near water courses and have “manure setbacks” which is an area in the field that runs along the watercourse where manure cannot be spread. These sections are generally sampled separate to be sure that the N and P content of the soil are not of concern. The soil sampling will continue into the winter months which means sampling even in the snow if that’s how the weather turns out. Thousands of samples will be taken from New York, Pennsylvania and Vermont, then be sent back to the lab and analyzed just in time to give farmers recommendations for next planting season.